Tosanoides aphrodite sp. n. in its natural environment, photographed at a depth of 120 m in St. Paul’s Rocks, Brazil. Photograph by LA Rocha. Moment of discovery: Imagine being so transfixed when spotting an amazing new fish species that you fail to notice the massive Sixgill Shark swimming overhead, even as a dive partner repeatedly tries to bring your attention to it! Watch it happen, now! This is just part of the intrigue behind the bedazzling new Anthiadinae species. It was discovered by California Academy of Sciences researchers at St. Paul’s Rocks in the Atlantic Ocean, nearly 600 miles away from the coast of Brazil (which controls the island group) during an expedition that was part of the organization’s Hope for Reefs initiative. The new species, Tosanoides aphrodite, was described by authors Hudson T. Pinheiro, Claudia Rocha, and Luiz A. Rocha in the open-access article Tosanoides aphrodite, a new species from mesophotic coral ecosystems of St. Paul’s Rocks, Mid Atlantic Ridge (Perciformes, Serranidae, Anthiadinae), published in the journal ZooKeys. The discovery is noteworthy for a number of reasons beyond the impressive appearance of the fish. 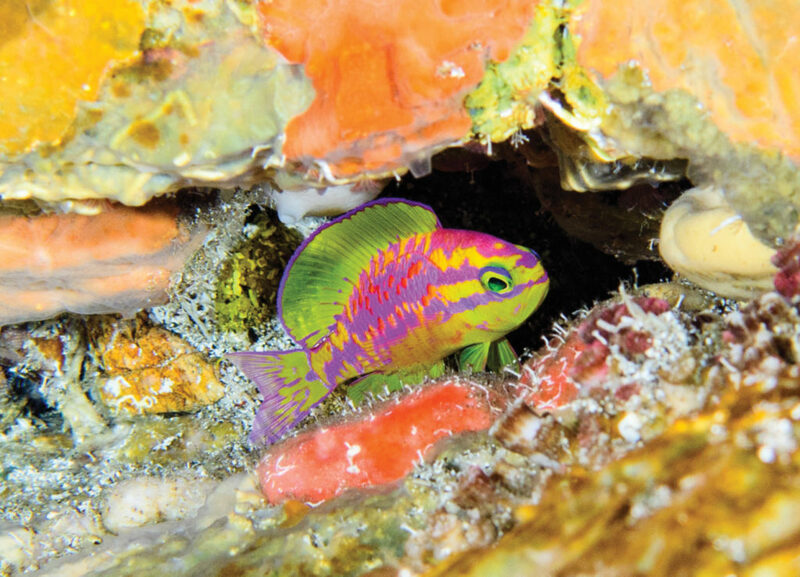 T. aphrodite joins the St. Paul’s Rocks’ endemic species flock, which includes another deepwater Anthias described only 20 years prior, Odontathias cauoh. St. Paul’s Rocks’ isolation leads to low biodiversity and high endemism, according to the authors, and the Aphrodite Anthias is now the 8th endemic (found nowhere else). T. aphrodite is also the first representative of the genus Tosanoides found in the Atlantic Ocean; all prior known species are found in the Pacific Ocean (T. filamentosus, Japan; T. flavofasciatus, Japan & Melanesia; T. obama, Hawaii). The holotype and paratypes were all collected using hand nets at 120 meters (393 feet) depth; the researchers utilized mixed-gas, closed-circuit rebreathers to journey to the depths. Don’t plan on seeing this species in the aquarium trade—the isolated location is difficult enough to reach, to say nothing of the depths that must be reached to obtain it. Furthermore, St. Paul’s Rocks is part of the Fernando de Noronha Environmental Protection Area, and is a national park, meaning special permits are required to collect fishes like these. 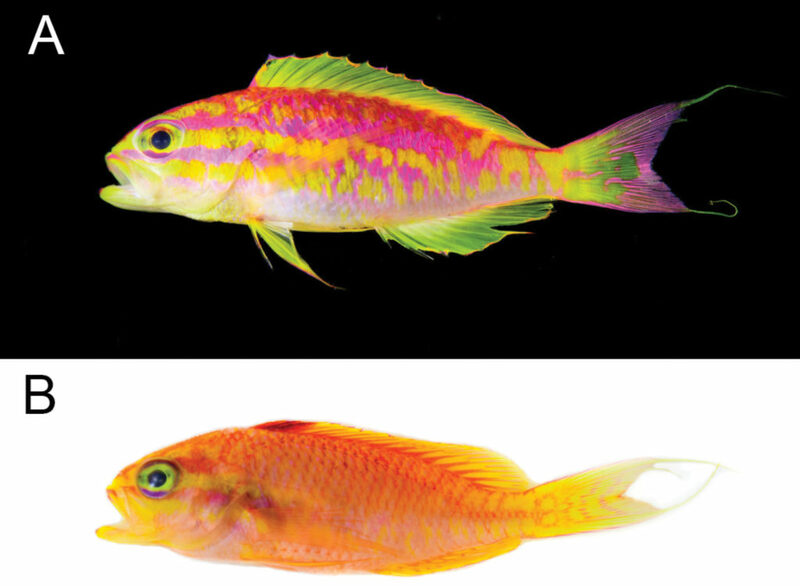 Learn more about this story of species discovery with insights from the researchers in the article Team discovers new species of dazzling, neon-colored fish, published by the California Academy of Sciences via Phys.org.